Patrick Comerford: Grealish hopes for a Villa cup win, but does Cameron know where he’s from? does Cameron know where he’s from? 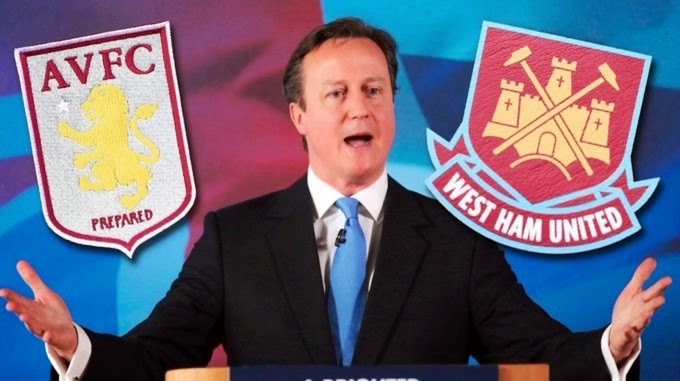 But David Cameron also said once that he was an Aston Villa supporter … and then called on people to support West Ham. Is David Cameron going to follow Aston Villa to the FA Cup Final? And is David Cameron truly “a real mixture of Scottish, Welsh and English”? I was once told his grandmother was from Staffordshire. So was she Welsh or was she from Staffordshire? Following the triumph of the Scottish National Party, how Scottish is he? And, indeed, if he is “a real mixture of Scottish, Welsh and English,” does he have any Irish family connections? David William Donald Cameron was born in the London Clinic, London, on 9 October 1966, the younger son of stockbroker Ian Donald Cameron (1932-2010) and his wife Mary Fleur (née Mount), a retired Justice of the Peace and a daughter of Sir William Mount, 2nd Baronet. His parents were married on 20 October 1962, and he has a brother, Alexander Cameron (born 1963), a barrister and QC, and two sisters, Tania Rachel (born 1965) and Clare Louise (born 1971). The first start in tracing his family tree, and perhaps the easiest way to set out on in search of his true identity, is to trace the direct male line of descent. Ian Donald Cameron (1936-2010), who, according to different accounts he was born at Blairmore House, a country house near Huntly, Aberdeenshire, in 1936, or in London in 1932. He was born with both legs deformed and had repeated operations to correct them. In 1962 he married in Saint Nicholas’s Church, Wasing, Mary Fleur Mount. He was the senior partner in the stockbrokers Panmure Gordon & Co, a firm where many members of the Cameron family had held partnerships. He died near Toulon in France on 8 September 2010. Ewen Donald Cameron (1906-1930), born in Kensington in 1906. He too was a partner in the stockbrokers Panmure Gordon & Co. He married in Saint Mark’s Church, North Audley Street, London, in 1930 Enid Agnes Maud Levita, (1908-1993). He died in London in 1958. Ewen Allan Cameron (ca 1879-1937). He was born in Shanghai, China, around 1879, although the year is unclear. He too was a partner in Panmure Gordon stockbrokers and served on the Corporation of Foreign Bondholders, and the Committee for Chinese Bondholders, set up by the then-Governor of the Bank of England, Montagu Norman in 1935. He married in Glass, Aberdeenshire, in 1905 Rachel Margaret Geddes. She was born in Chicago, Illinois, ca, 1880, although once again the date is unclear. Her father, Alexander Geddes, was a Chicago grain merchant, who returned to Scotland and built Blairmore House, Glass, where he died on 2 July 1902. Ewan Cameron died in Vienna, Austria, on 14 November 1937, and his widow died in Seaford on 19 May 1969. Sir Ewen Cameron (1841-1908). He was born in Invernessshire, and worked with a variety of Indian and Chinese banks in Calcutta, Shanghai and Hong Kong. He was the London head of the Hong Kong and Shanghai Banking Corporation (HSBC), and he played a key role in arranging loans from the Rothschild family to Japan during the Russo-Japanese War. In 1878 in Norfolk he married Josephine Elizabeth Houchen from Shotford, Norfolk. He died in London in 1908. William Cameron (1806- ), a crofter. He was born in Abertarff, Croy and Dalcross, Invernessshire, but I have not found his date of death. He married Catherine Cameron in Glenmoriston, Invernessshire, in 1840. James Cameron (1776-1865), who was born and died in Croy and Dalcross, Invernessshire. He married Margaret Fletcher. Alexander Cameron, the earliest of David Cameron’s direct ancestors in the male line that I can find. I have found no dates for his life events. So the Cameron family can be traced back about 250 years, or perhaps a little more. The family is Scottish ancestry, with humble beginnings at crofters. But many of the Cameron ancestors lived and died in a variety of places, including London, Calcutta, Shanghai, Hong Kong, Vienna, Chicago and Toulon, so the “real mixture of Scottish” ancestry is quite diluted. So what about his supposed Staffordshire roots? Or that “real mixture” of Welsh ancestors through his mother and grandmother? David Cameron’s mother, Mary Fleur Mount (born 22 October 1934) is the daughter of Sir William Mount (1904-1993) of Wasing Place in Berkshire and his wife Elizabeth Nance Llewellyn (1904-1997). 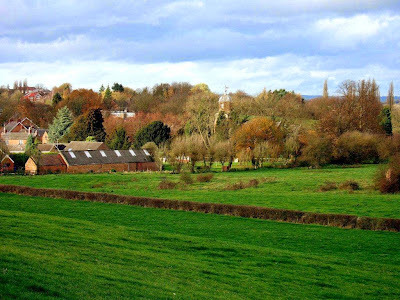 But Lady Mount, despite the Welsh ring to her maiden surname, Llewellyn, was born not in Wales but in Marchington, a small, attractive village near the banks of the River Dove in East Staffordshire, south-east of Uttoxeter and north-west of Burton upon Trent. 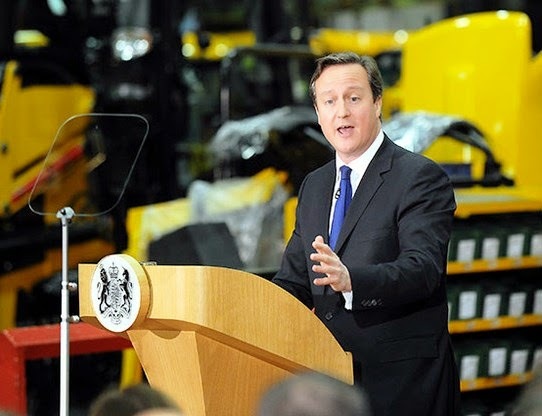 Those roots in Uttoxeter may have come to mind last November when Cameron visited the headquarters of JCB in Rocester, near Uttoxeter. This was his sixth visit to the Tory-held constituency and, according to a report in the Uttoxeter Advertiser, he used that visit to make yet another speech on curbing immigration … which would not have been god news to his ancestors who moved to England from India, China and Germany. Her father was born in Somerset, and in fact, I had to go back to Cameron’s great-great-grandfather before I could find a Welsh-born Llewellyn ancestor, Lieut-Col Evan Henry Llewellyn, a Tory MP for Somerset and a landowner who was born in Llangafelach, Glamorganshire, in 1847. But his father was from Devon, and this Welsh-born ancestor spent most of his life in Somerset, apart from his spells in the army in Africa. So Welsh ancestry is probably thinner and more difficult to find than Scottish-born ancestors. Claiming he is Scottish or Welsh is as absurd as Cameron claiming he is Chinese, or Austrian, or American … or royal for that matter. Yes, David Cameron is also descended from royalty. Through his paternal grandmother, Enid Agnes Maud Levita, he is a lineal descendant of King William IV and his mistress Dorothea Jordan. This illegitimate line consists of five generations of women starting with Elizabeth Hay, Countess of Erroll, who was born Elizabeth FitzClarence, the sixth of ten children of King William IV and Dorothea Jordan (1761-1816). The only Irish ancestry I have found for David Cameron, so far, is through this descent from Dorothea Jordan. She was the king’s mistress and constant companion for 20 years while he was the Duke of Clarence, and together they had 10 illegitimate children, all of whom were given the surname FitzClarence; their eldest son was given the title of Earl of Munster. She was born Dorothea, Dorothy or Dora Bland in Waterford on 22 November 1761. Her father was the son of Nathaniel Bland (1695/96-1760) from Killarney, Co Kerry, Vicar General of Ardfert and Aghadoe, and Judge of the Prerogative Court of Dublin. Despite this illegitimate label, this particular line of ancestry means David Cameron is a fifth cousin twice removed of Queen Elizabeth II). But then he is also an eighth cousin of Boris Johnson the Mayor of London and Jo Johnson, Conservative MP for Orpington, and a more distant cousin of George Osborne. He is also a descendant of Jewish bankers and Yiddish scholars. Cameron’s great-great-grandfather, Emile Levita, was a German Jewish financier and a direct descendant of the Renaissance scholar Elia Levita, the author of Bovo-Bukh, the first secular work ever published in Yiddish. Emile Levita became a British citizen in 1871 and was the director of the Chartered Bank of India, Australia and China which became Standard Chartered Bank in 1969. And what about the family links to Aston Villa? Cameron has long claimed he is a supporter of Aston Villa, but last month he confused Aston Villa with West Ham in the course of an election campaign speech. How could he forget? Cameron is the nephew of Sir William ‘Bill’ Dugdale (1922-2014), former Chairman of Aston Villa Football Club (1975-1982), and whose second wife was a sister of Cameron’s mother. Some reports say he was a distant cousin of Rose Dugdale, but I have not been able to confirm this kinship. When he died last year, the Tamworth Herald recalled his many exploits, his role in Aston Villa, and reported his Warwickshire homes included Merevale Hall, near Tamworth, and Blyth Hall near Coleshill, south of Tamworth. The Aston Villa player Jack Grealish has yet to choose whether he wants to play for England or the Republic of Ireland. His grandparents are from Galway and Dublin, but he was born in Solihull, so it is understandable that this 19-year-old still has to work on his identity. But David Cameron’s Scottish and English roots have done nothing to help preserve the union between Scotland and England, his Welsh roots and Irish roots seem to have little impact on his politics either, and the German, French and Austrian connections through his immediate ancestors have nothing to help him keep Britain in the EU, and his Indian and Chinese connections in his ancestry seem to have played little part in shaping his attitude to immigration. At least Jack Grealish will be hoping for a Villa win in the FA Cup Final. But what about David Cameron? Does he know where he’s from?